A South African recipe and games book for children, written by nine-year-old Josh Thirion, has won a prestigious international cookbook award. A South African recipe and games book for children, written by nine-year-old Josh Thirion, has won a prestigious international cookbook award. 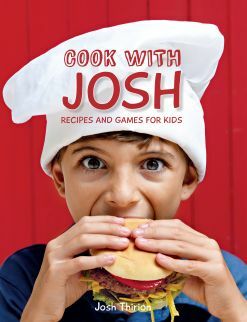 Cook with Josh is the winner of the 2013 Gourmand World Cookbook Award for Best in the World in the children’s category. These awards are considered the Oscars of the food and wine industry, and Josh’s book was selected from thousands of books worldwide. Through his book, Josh hopes to inspire other children to get into the kitchen and start cooking, and also to encourage future generations of South African MasterChefs. The book contains 48 easy step-by-step recipes, and, using his talent for drawing, Josh has created activities such as colouring-in, mazes, word games, crossword puzzles, spot-the-difference and connect-the-dots. It includes ideas for drinks, breakfasts, lunches, dinners, desserts and treats, from classic peanut butter smoothies, beef stew and pizza monsters, to old-fashioned favourites such as coconut fudge, malva pudding and rainbow popcorn. Josh’s mom, Lynn Thirion, says he never wrote the book to be published. His only intention was to sell it at the Mzansi Magic Market Day, a national competition to encourage children to develop entrepreneurial skills. The first time he entered the competition, when he was just seven, he made toys from recycled materials, but by the following year the entire family was hooked on MasterChef, a BBC television cookery game show. Thirion says that Josh’s dad noticed his comic strip recipes, and encouraged him to develop the idea for the market day. He made 30 copies of the handmade recipe book to sell on the day, and they were so popular that his business idea won out of more than 400 stalls. It was after this success at the market day that Random House publishers approached the Thirions to take the idea further. “One idea led to the next and I decided to do a cookbook with a difference, an activity cookbook,” Josh says. His mom says he comes from a creative family – all the Thirions enjoy painting and she noticed Josh’s artistic talent at an early age. The family has also always enjoyed cooking together, and she thinks this, too, probably made a lasting impression on her son. “His talent for drawing was the first thing we noticed. His interest in cooking only came later,” she says, but adds that he seemed to be interested in making food even when he was very young. “We love to camp and one year on a camping trip he was making his own peanut butter and honey sandwiches,” she says.